Talks between Israel and PA postponed past US midterm elections despite alleged US concessions. While on a North America tour promote his new book, The Punishment of Gaza renowned Israeli journalist Gideon Levy spoke in Canada. The Real News’ Lia Tarachansky caught up with him in Toronto to ask him about the expiration of the so-called settlement construction freeze, or moratorium, and the lull in the peace talks between Israeli prime minister Benjamin Netanyahu and Palestinian Authority president Mahmoud Abbas. According to David Makovsky of the Washington Institute on Near East Policy, Obama sent Netanyahu a letter offering him major concessions if the Israeli prime minister extends the settlement construction freeze past the U.S. midterm elections. One concessions Obama supposedly offered Netanyahu is the long-term stay of Israeli troops on the soil of the future Palestinian state in the Jordan Valley, a region central in the fight for water and land. However, both Netanyahu and Abbas refused to take a position, passing the ball into the court of the Arab League which in turn postponed taking a position until after the U.S. elections. Journalist Jonathan Cook and Israeli human rights lawyer Michael Sfard on apartheid & Israel. Renown Nezareth-based journalist Jonathan Cook says not only is Israel’s control of the West Bank based on an apartheid system of segregation but also the system inside Israel proper. One of the top Israeli human rights lawyers, Michael Sfard, disagrees. In a Tel Aviv interview with The Real News’ Lia Tarachansky he talks about his conclusion that Israeli control in the West Bank is now only moving towards an apartheid-like system based on the dual legal systems that Israeli settlers and Palestinians get subjected to. He describes that if an Israeli settler and a Palestinian were to be arrested for the same crime, they would be judged, investigated, and convicted in separate legal systems. Jonathan Cook is a British journalist based in Nazareth, Israel. He has written for the Guardian, International Herald Tribune and Le Monde diplomatique among other publications, and is currently a correspondent for the Abu Dhabi-based National newspaper. He is the author of three books on the Israel-Palestine conflict, the latest being Disappearing Palestine. Michael Sfard is one of the top Israeli human rights lawyers. His Tel Aviv-based practice represents many Israeli human rights groups and high profile rights cases. Most famous is his firm’s challenge of the separation wall annexing land from the West Bank village of Bil’in. A former conscientious objector, Sfard represents reservists and others who refuse to participate in the occupation of the Palestinian Territories. Every year on May 15, Palestinians the world over mourn what is known as Nakba Day. The Nakba is Arabic of catastrophe and represents the 1948 ethnic cleansing when nearly 800,000 Palestinians became refugees. In this segment, Lia Tarachansky of The Real News and Yossef(a) Mekyton of Zochrot speak to Israelis about what they know of this history and the war of 1948, the result of which was the establishment of the state of Israel. This week, the European Union’s Parliament passed a resolution endorsing the implementation of the recommendations of the Goldstone Report, which investigated war crimes in the attack on Gaza last year. While the motion was received with support from many NGOs, such as the Women’s Peace Coalition, it did not indicate specific actions the EU will actually take. The same has been true for the UN’s process as members of the Security Council said they would veto the report. Many are therefore taking it in their own hands to hold Israeli leaders accountable for alleged war crimes. The legal tool they’re using is called universal jurisdiction and refers to the Fourth Geneva Convention of 1949 that said countries must be able to prosecute anyone who commits grave crimes. The Real News’ Lia Tarachansky investigates what universal jurisdiction is, how it is used, and how Israel is fighting against it. Daniel Machover is a partner at the British legal firm Hickman & Rose Solicitors in London and is their Head of Civil Litigation. He was the Co-Founder of Lawyers for Palestinian Human Rights in 1988 and works with Israeli and Palestinian lawyers and NGOs on legal remedies for Palestinians. Working for mutual clients of the Gaza-based Palestinian Center for Human Rights, he and his colleagues, particularly Kate Maynard, have been involved in the efforts to arrest suspected Israeli war criminals in the UK and beyond, notably General Doron Almog in September 2005, but also (working with legal teams in several countries) Moshe Ya’alon (New Zealand, December 2006), Ami Ayalon (Netherlands, May 2008) and Ehud Barak and others (Spain, June 2008 on-going). This week the Russell Tribunal on Palestine ruled in Barcelona, Spain on six questions concerning the Israeli-Palestinian conflict. The Tribunal’s judgements are not judicially binding but are meant to examine the complicity of the European Union in perpetuating what the Tribunal called Israel’s “policy of war, occupation, and colonization for 60 years.” The jurists were assembled from around the globe and issued their conclusions on Wednesday, March 3rd. Among the conclusions, the jury stipulated that Israel practices a form of apartheid. The Real News’ Lia Tarachansky attended the Barcelona session and spoke to jurists and participants. This week, the chief Palestinian negotiator, Saeb Erakat, announced that because Israeli settlements continue to grow (with de facto US support) and annex the land planned for a future Palestine, the Palestinians may have to abandon hopes for an independent state. He therefore urged Palestinians to fight for one democratic state where all citizens will be equal. With this announcement, many are wondering what the future of the Israeli occupation would look like. Meanwhile, Israel is continuing its technological evolution of the occupation, making it possible to institutionalize control over the occupation remotely. At the end of October, the joint Israeli-Palestinian Alternative Information Center held a conference in Bethlehem on economy of the occupation. The Real News’ Lia Tarachansky attended and spoke to Dalit Baum of Who Profits and Shir Hever, of the Alternative Information Center about the changing face of the Israeli occupation. As the US-mediated peace talks threaten to collapse, Israel ramps up its occupation of the Palestinian Territories. 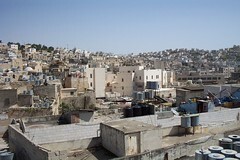 The Israeli daily Ha’aretz reported last Friday that at least 11 locations within settlement colonies in the West Bank are escalating construction in order to alter “facts on the ground.” Last weekend, the joint Israeli-Palestinian organization, Alternative Information Center, organized a conference on the economy of the Israeli occupation in Bethlehem. The Real News’ Lia Tarachansky attended and spoke to the AIC’s Shir Hever about the real costs of maintaining Israel’s occupation.